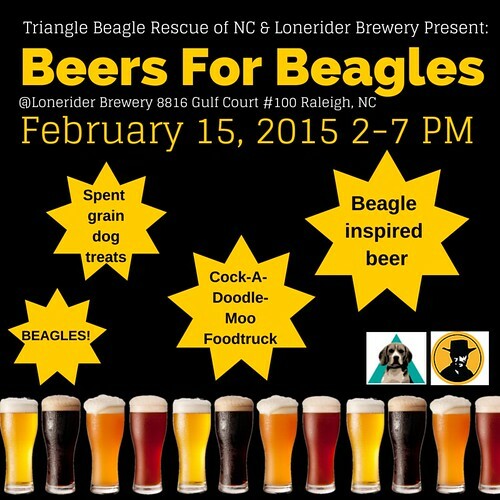 Beers for Beagles at Lonerider Brewery Sunday Feb. 15th! Who doesn’t like beer and dogs? 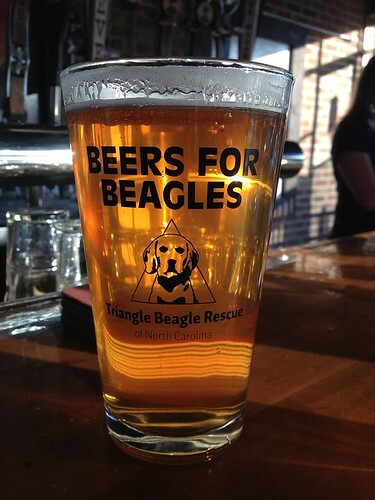 Join the Triangle Beagle Rescue of North Carolina (TBR) at Lonerider Brewery in Raleigh on Sunday February 15th from 2 pm – 7 pm to raise money for the beagles! In addition to the usual Lonerider favorites guests will be able to sample some special beagle inspired brews. I hear there may a special keg of Lonerider’s Sweet Josie Brown Ale brewed with either peanut butter or chocolate and peanut butter. A portion of beer sales will go to support TBR. The CockADoodleMoo food truck will be there selling food for humans. There will also be special dog treats made from Lonerider spent grains four your four-legged friends. Your Beagles are welcome, although they ask that you keep them outside in the tented area. Triangle Beagle Rescue is a breed-specific beagle rescue in the Triangle. They are a 501(c)(3) tax-exempt organization and are an all volunteer organization run by a Board of Directors. They do not have a shelter facility and operate solely out of foster homes. This ensures that all of their beagles learn the skills that they need to be successful family members when they move to their forever homes. TBR has been rescuing beagles since 1999 and, to date, have rescued more than 1500 beagles in North Carolina. They are committed to bringing together humans and hounds for a lifetime of love and pleasure in each other’s company! For more information visit http://www.tribeagles.org/.